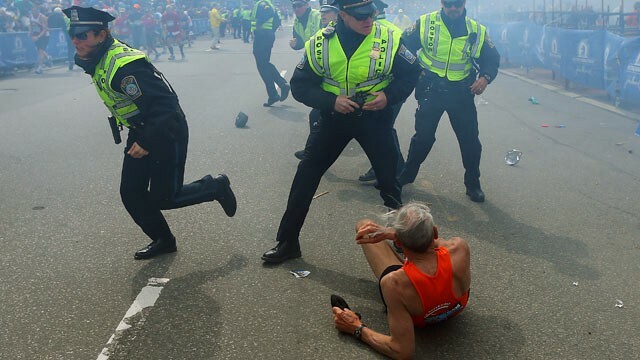 Eyewitnesses at the Boston Marathon described the ground shaking beneath their feet, smoke and "a lot of chaos" this afternoon when explosions killed two people and injured dozens. Rachel Sibley, 22, was 50 feet from the finish line waiting for a friend to cross. "All of a sudden I heard this bang that sounded like a cannon," she said. "You could see people looking up at the sky like there were fireworks, like a celebratory bang. The whole crowd waited for a moment, and then the second one went off. It was terrifying and absolute chaos. Who said a picture is worth a thousand words?